Part 1 - The "receiver" desktop app. Change the (Manager)Text property on the TTetheringManager to 'BarcodeReceiverManager', on the TTetheringAppProfile change the (Profile)Text property to 'BarcodeReceiver' and set the Manager property to point to the TTetheringManager. Since we want to send the received barcode to the active application, we just use a send key function - in this case I have just used the WinAPI keybd_event() method - it would be more correct to use SendInput() - but the barcodes consists of non-unicode characters. For the letters we also need to send along the shift key. On the TTetheringAppProfile.OnResourceReceived event add the following code to send the string received from the mobile app - and maybe a carriage return - if our TCheckBox is checked. Part 2 - The "sender" mobile app. On the TTetheringAppProfile set the Manager property to point to the TTetheringManager. Now on the FormShow event we want to unpair any Managers already paired with this TTetheringManager, and after that trigger the Discover event. Now we can start our "receiver" application, and run our "sender" mobile app on iOS or Android, and in theory it should work. I did put the tethering example to a minimum, for a more correct examples see the samples include with XE6 - it seems that there is a lot of extra stuff hidden in these 2 components - maybe for another post. Part 3 - Barcode scanning. There are some examples out there for doing this both on Android and iOS - I guess you could also invest in some commercial components like those from TMS or WinSoft. I previously been using the ZBar library on iOS/ObjectiveC and xzing library Android/Java - because ZBar wasn't that good on Android years back. Update: Software Union also provides Java2Pas which might do the trick. I did have a peek at the code from Thomas K's TKRBarcodeScanner component (beware terrible link :-) ) which for iOS is depending on the TMS component. Notice the TValue from the System.Rtti unit - it is kind of a Variant and then not. On the FormCreate event we start testing if the platform supports what we think of as a clipboard, and we also wants it to support application events - so that we can check when the intent is done and our app becomes active again. We create an instance of TJIntent, set its action to the zxing barcode scanner intent, which you might need to install on your mobile before running this app, if you do not already have the intent via some other app. You need to convert the name of the intent to a Java string. You can among other things also specify which barcode types that can be read - doing that increases the speed and precision of the scanning - so if you know you only need Code 39 or EAN13 you should specify that. When the application event fires, we check if it was because our app became active and we were monitoring the clipboard. Done - you should now have a working app - which could need a lot of extra error checking and care. But like baking your own bread I hope this has been fun. I have added some extra links below to people or code that might also be helpful - including the full code for download. If you just have interest in the barcode part there are better examples in the links below - also be aware that in XE6 the StringToJString has move to the Androidapi.Helpers unit. 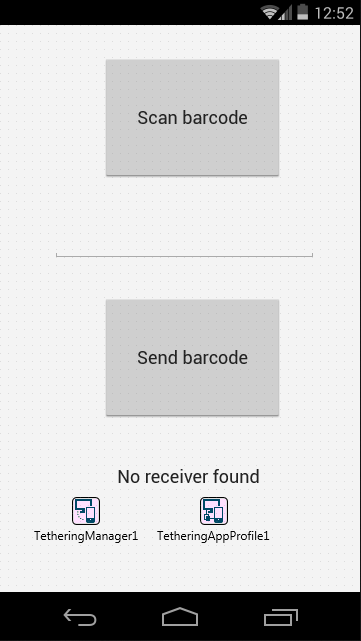 The source code: Receiver application and Scanner app. FMX Express is very active collecting relevnat stuff: http://www.fmxexpress.com/qr-code-scanner-source-code-for-delphi-xe5-firemonkey-on-android-and-ios/ - there is also a better link to Thomas K. code there. I love it! Good work. Awesome blog post. Clean, clear example using XE6's App Tethering. Thanks - I did update the post - the description on the download link states "kostenlos" - but there is a "Purchase" option - and I can see from the code it generates that you do not get the implementation - unless you register. Seems like a nice inexpensive offering. Thanks Oliver, I will hopefully update the post later today - showing the benefits of the interface wrappers you did. If you have any suggestions to enhance Java2pas, please feel free to use our mantis bugtracker. :) Yes, I think I share the same issue as the PhotoWall Sample - which I looked at when I tried out the tethering - if you look at the RefreshList in the sample, change it to only add VCLMediaReceiverApp in the LbWall - you still might end up connecting to a MediaReceiverApp - because TakePhotoManager.RemoteProfiles holds all the profiles of the pair managers - i guess. Well I will at least fix my example - and simplify them - one Manager, one Profile - no loops - Thanks. BTW. it seems that the 32-bit VCL is a false-positive at AVAST - that is a different kind of bug-checking. So, in a nutshell, app tethering is IPC for Delphi objects? Why couldn't anyone say so from the beginning? Hi, thanks for your answer. The problem was solved. I was compiling on a virtual machine and it has different subnet when comparing with my desktop and google glass. It means 3 network subnets, when it most be the same... Sorry!! In my case I just transfer images and text (without barcode). Thanks a lot! To keep things simple, I would just keep sending a string with the barcode and the quantity, separated by a # or ¤ (what ever separator char you prefer). And then change the desktop "receiver" to parse the string into 2 and send a tab or return - what ever needed in between. But since you are not limited to string - you could send a stream with whatever structure you like and parse and act upon that on the receiver end. at the end I just want to know if I will have to wait to resolve this error from jetty, you owe the antencion, and I apologize if my questions are silly means am a newbie in this and in my English. I would add the ReportMemoryLeaks := True; in the project and run the client on Windows to see if there might be any memory leaks. It is an "AV" error, take a look at this post in the embt forums: https://forums.embarcadero.com/message.jspa?messageID=645831. Creating a small example that reproduces the error and then sharing that - with me or Embarcadero's forums will probably be more helpful in solving the issue. I'm developing an application that will be using a barcode scanner. Now the problem I'm having is that when I do scan the barcodes it only displays the first number of my barcode in the TEdit. When I test the barcode itself by scanning it say to MS Word or Notepad it scans the whole barcode and displays the whole number sequence correct. So is there any code that I need to write to make the scanner read more then 1 number from my barcode when it is being scanned with my delphi application? It is not quite clear to me if you are also writing the barcode scanner yourself, or we are talking about a "physical" USB connected barcode scanner. 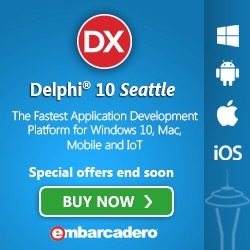 But what version of Delphi are you using? If it is just a barcode scanner that acts as keyboard input, then whatever window control that has focus and can receive keyboard input - like Word, Notepad or TEdit should work - unless your barcode scanner adds some value by not using the keyboard buffer, but sending maybe unicode strings - and your TEdit is a per-Delphi 2009 version (that being non-unicode). I would need a bit more detail - the reference to the "java barcode scanner" did confuse me a bit. Have you tried zxing and my example described above? Well my bet is on type differences between the receiver and the sender. What if I change TTetheringManager AllowedAdapters property to Bluetooth. Do i have to change any part of code? [Copy Error] Unable to copy file "\ library \ lib \ armeabi-v7a \ libMobileBarcodeKey.so" to "\ debug \ libMobileBarcodeKey.so". Could not find a part of the path '\ library \ lib \ armeabi-v7a \ libMobileBarcodeKey.so'. Does anyone know what I can do to correct it and to generate the .apk?